Jean Baudrillard is widely recognized as one of the most important and provocative writers of our age. Variously termed “France’s leading philosopher of postmodernism” and “a sharp-shooting Lone Ranger of the post-Marxist left,” he might also be called our leading philosopher of seduction or of mass culture. Following his acclaimed America and Cool Memories, this book is the third in a series of personal records in hyperreality. Idiosyncratic, outrageous, and brilliantly original, Baudrillard here casts his net widely and combines autobiographical memories with further reflections on America, the crisis of cultural production, new ideas in fiction/theory, and the “verbal fornication” of the postmodern. In this wide-ranging discussion of events and ideas, Baudrillard moves between poetry and waterfalls, strikes and stealth bombers, Freud and La Cicciolina, shadows and simulacra, deconstruction and the zodiac, Reagan’s smile and Kennedy’s death, the “curse” on South America and the future of the West, the last tango of French intellectual life and the exemplary disappearing act of Italian politics. Writing at the site where the philosophic and the poetic merge, he once again offers us commentary in the form of the riveting insight, the short distillation of reality that establishes its truth with the force of recognition. 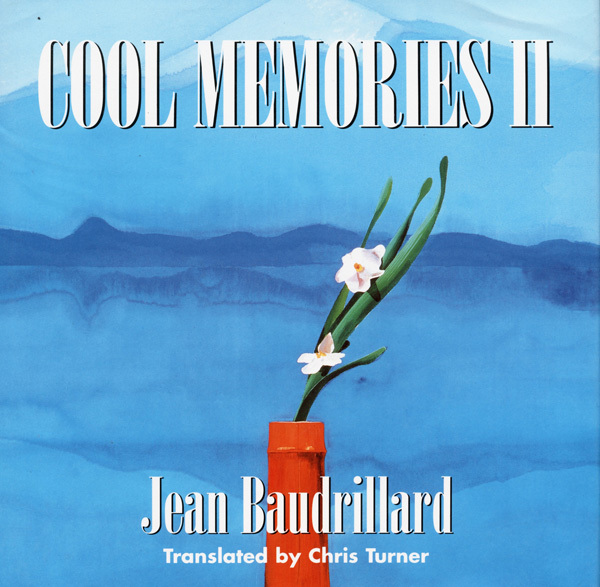 Cool Memories II, Baudrillard’s latest commentary on the technopresent and future, an installment of his reflections on the reality of contemporary western culture, will entice all readers concerned with postmodernism and the current state of theory. Jean Baudrillard, Professor of Sociology at the University of Nanterre from 1966 until 1987, is the author of many books, including In the Shadow of the Silent Majorities, Simulations and Simulacra, Fatal Strategies, Seduction, America, Cool Memories, The Transparency of Evil, and The Illusion of the End.